The plight of shade gardeners is a common one. We look longingly, and with more than a bit of envy, at those neighbors who have full sun, who can grow, it seems, everything that our fate has prohibited us from growing. Oh, those bright, cheery annuals, those roses, those gorgeous flowering shrubs. And what do we get? Grass. Ferns. Hostas. Or, so we think. But there is so much more available to gardeners with shady yards. Shade gardeners have a great number of gorgeous plants available to them. To prove it, here are twelve wonderful plants that will thrive in four hours of sun or less. 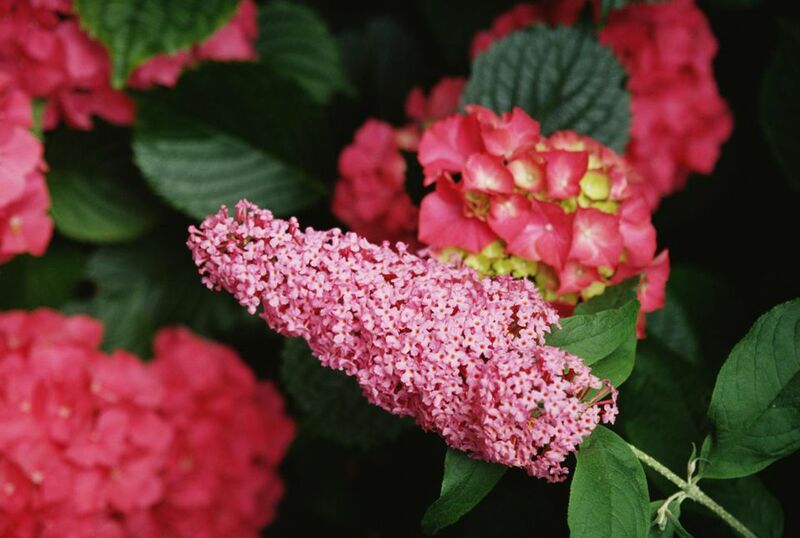 Butterfly bush (Buddleia davidii): Butterfly Bush will do just fine with about a half day of sun and will provide the shade garden with cheerful blooms. It grows up to ten feet tall, depending on cultivar, and blooms in pink, red, purple, white, and yellow. The blooms are graceful, arching panicles of dozens of tiny, individual flowers. A bonus: plan on attracting butterflies to your shade garden as well. They can't resist butterfly bush! Butterfly Bush is hardy in zones five through nine, but some care should be taken as they tend to become invasive in milder climates. Red twig dogwood (Cornus stolonifera): For year-round interest in the shade garden, it's hard to beat the red twig dogwood. In spring, it will leaf out, followed in summer by tons of white blooms. In fall, the leaves will turn a breathtaking coppery purple. Even after the leaves all fall, it will still be gorgeous throughout the winter, thanks to the bright red bark on its branches. Red twigs do well in part shade but will tolerate full shade. Hardy in zones two through seven, they can ultimately grow to eight feet tall. However, to keep the bark vibrant, be sure to cut out some of the older branches, as the new ones that grow in have much brighter bark. Oakleaf hydrangea (Hydrangea quercifolia): Oakleaf Hydrangea (hardy in zones five through nine) is a beautiful addition to the shade garden. It is perfectly happy in part shade, and will easily grow to six to eight feet tall. It blooms in late spring, forming panicles of white flowers that will eventually fade to pink in summer and to brown by fall. If left on the shrub, these faded panicles will provide winter interest as well. Besides the flowers, oakleaf hydrangea has gorgeous, exfoliating bark with cinnamon undertones. Forget-me-not (Myosotis sylvatica): Forget-Me-Nots will thrive in full to part shade. They grow to about twelve inches tall and have small, bright blue, daisy-like blooms with bright yellow centers. Forget-me-Nots are hardy in zones three through nine and reseed prolifically, so some care might need to be taken to make sure they don't become invasive. Columbine (Aquilegia canadensis): Columbines are native North American perennials (hardy in zones three through eight) that will perform beautifully in a garden that gets about a half day of shade. They can grow up to three feet tall, depending on the cultivar, and produce elegant blooms in shades of red and pink. Columbines also self-sow readily. Hardy geranium (Geranium sanguineum): Hardy geranium is very different from the annual geraniums (which are actually pelargoniums) we buy for porch pots or bedding plants. Hardy Geraniums form low mounds and bloom from spring through fall in white, red, purple, pink, or blue. They will thrive in part shade, and some cultivars do perfectly in full shade. Another bonus is that hardy geraniums tolerate dry soil—a common problem when planting under trees. They are hardy in zones four through eight. Coral bells (Heuchera): For show-stopping color in the shade garden, coral bells are unbeatable. Recent breeding has produced plants with foliage in just about every color imaginable, from coppery orange to pure black; deep purple to chartreuse. Coral bells do great in part to full shade and form low mounds of foliage. They also produce flower spikes of delicate, bell-shaped blooms. Depending on the cultivar, coral bells are hardy in zones three through nine. Astilbe (Astilbe): Astilbes (hardy in zones four through nine) grow wonderfully in part to full shade, as long as they are in nice, moist soil. It produces feathery plumes in white, pink, purple, peach, or red in late spring through summer. Astilbe also self-sows readily, but the seedlings are unlikely to look like the original. In a naturalistic, informal setting, this can be a very attractive look. Bleeding heart (Dicentra spectabilis): Bleeding heart is an old-fashioned, absolutely beautiful plant for shade gardens. In spring to early summer, delicate, dangling flowers will appear, looking like rows of heart-shaped lockets. Bleeding Heart blooms in shades of white, pink, purple, and red, and grows up to four feet tall and three feet wide. It dislikes summer heat, however, and may go dormant if it is allowed to dry out. Not to worry—it will come back just fine in the spring. Bleeding heart thrives in part to full shade in zones two through nine. If it gets sun, morning sun is preferable to afternoon sun, which can be much too hot. Foxglove (Digitalis purpurea): Foxgloves are great for gardens in zones three through nine that get around four hours of sun per day. They bloom in mid to late summer, producing tall spikes of purple, pink, white, yellow, and red flowers. Foxgloves also reseed readily, so even though they are a biennial or short-lived perennial, they will likely establish themselves as a permanent fixture of the garden. Globe amaranth (Gomphrena globosa): For sites that get about a half day of sun (four hours) Globe Amaranth is a great choice. Its clover-like flowers will brighten any shady site. Gomphrena blooms in purple, magenta, pink, white and red. They are great used as an edging plant in a border or do nicely in containers. Nicotiana (Nicotiana alata): A charming, old-fashioned flower for gardens that get about a half day of sun is nicotiana, also known as flowering tobacco. There are many cultivars, ranging in size anywhere from one foot to five feet tall. They work great in mixed borders, and some of the older cultivars have a wonderful fragrance. Nicotiana blooms in purple, red, pink, white, yellow, and even green. Shade gardeners are limited only by their imagination. There are plenty of annuals, perennials, and shrubs available to make your shady garden just as spectacular as your neighbor's sunny one.